Today we're short one blogger here at DC headquarters as our resident art historian / patron saint of vocabulary is busy having zee bebe. That's French for Erin is in labour. In honor of our newest blogger, who remains unnamed but will be making his debut any minute now, I bring to you my favorite family portraits from across the interweb. 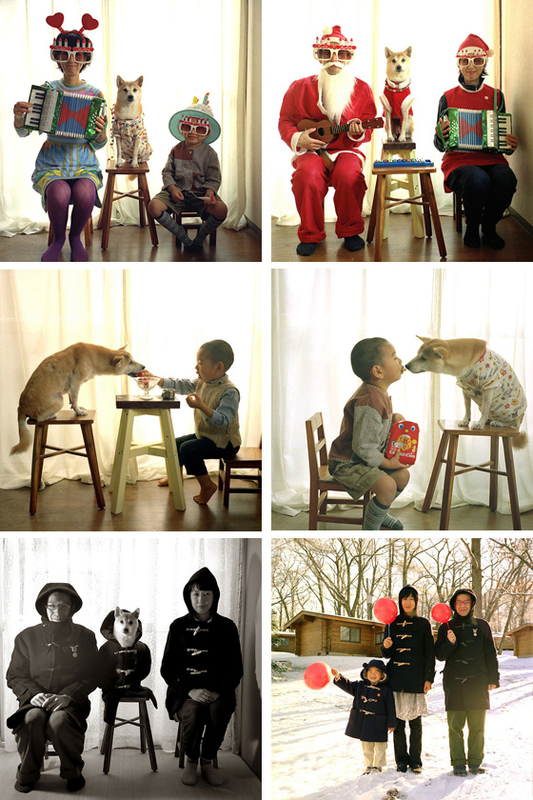 Family portraits by now defunct flickr user Akihiro Furuta via Booooooom. I have no idea if that's the right number of ooos. How do you even deal with a URL like that? 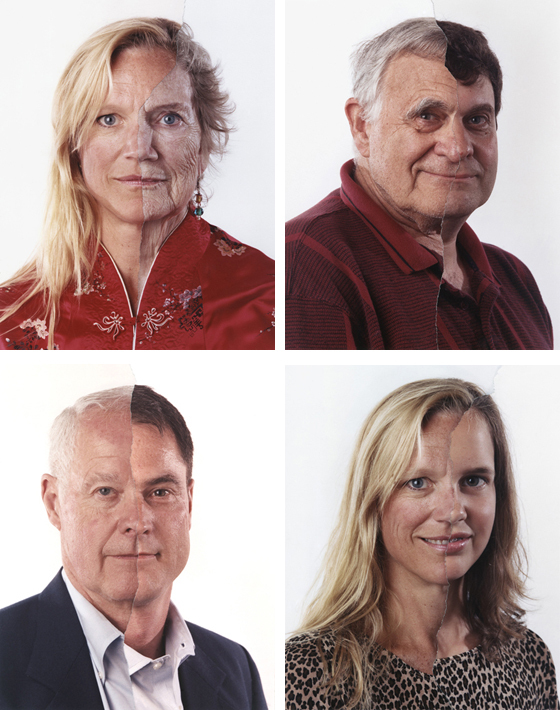 Family Tree by photographer Bobby Neel Adams. Portraits of mothers and daughers, fathers and sons are shot and merged to create a singular image. Mom, are you up for this? I tried to stick with just family shots and skipped over all portfolios filled with self-portraits except for this one by photographer Chino Otsuka. Chino has superimposed her image into pictures of herself as a child. The portraits are fascinating in that you see the immediate age progression of the little girl - the real version of Adam's family tree images - while simultaneously imagine that the recent image is an older sister or cousin. The eye can't quite believe that this is the same girl. So, yeah, it made the family portrait cut. 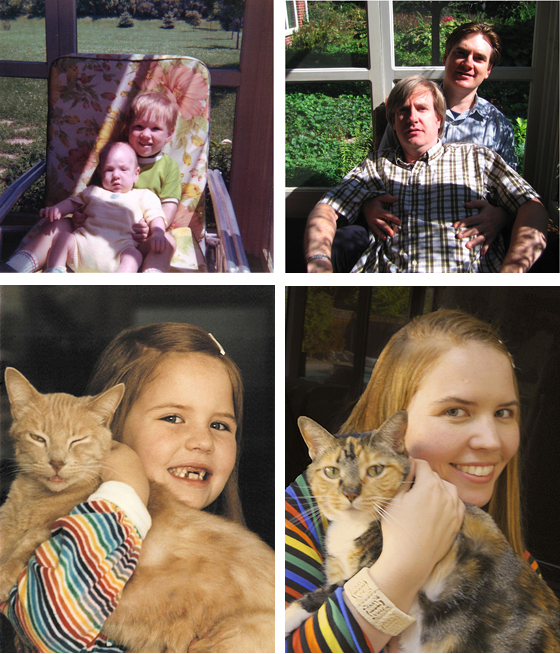 Familial age progression was also documented in last summer's web sensation Young Me Now Me. Look at all those twins! Sike! They're not twins at all. Photographer Francios Brunelle shot a series of portraits of people who look alike, the only rule: they can't be related. I've always wanted a twin, so this series fascinates me. Maybe it's not family portraits but you'll let me squeeze it in, right? 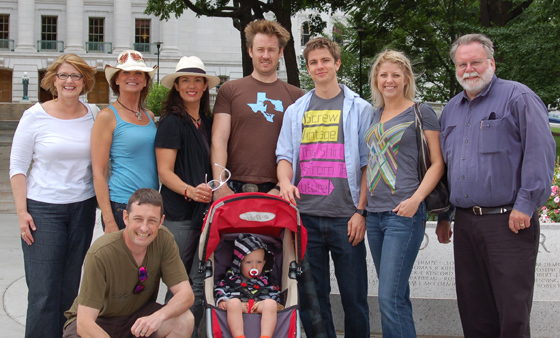 My family, Wisconsin, 6-29-09. Top Row from left to right: mama bear (Connie to those of you who read our comments), Aunt Darlene, Cousin Kim, Husband Matt (in desperate need of a haircut), brother Davis, K-Dawg, Step dad Randy; Bottom row: Kim's hubby Jason, their fearless son McKye. I don't have any pictures of Erin's new family yet (I don't think you want to see the ones in progress) but I promise to post some as soon as she's recovered. You may be a bit worried about me steering this ship alone for the next few weeks (that's very sweet of you, BTW) but none to fear, we have several fantastic guest bloggers lined up. They say it takes a village to raise a child and I'm sure that, even before giving birth, Erin will agree. Thanks to all our generous online buddies, you dudes will get to spend the next few weeks excavating art around Phoenix, rolling around in some serious bling and even sampling the world's finest designer foods. I'll still be here several times a week to talk about gold spray paint, horses, and hotels I can't afford, so, really, it's all good. Everyone be sure to get a good nights sleep tonight, for tomorrow morning you have to give a big bright welcome to DC guest post all-star, Raina. For now, I'm off to la hospital to visit my little buddy and to wish her, Ben and the baby all my love and best wishes for a happy and healthy future. Do you think I should sneak her in some turkey?